In 1086 Twickenham formed part of the Manor of Isleworth which with the Manor of Hampton (which included Teddington) were part of the Hundred of Hounslow. In the south of England the Hundreds were administrative divisions of the Shire. Both manors had belonged to Earl Aelfgar in the time of King Edward but were granted to Walter de Saint-Valery by William after the conquest. virgate, and 18 villans each [on] half a virgate, and 6 cottars. Acknowledgement: Folio image and translation with kind permission of Alecto Historical Editions. Hide - the amount of land which would support a household. Domesday Book - A Complete translation, Penguin Books. 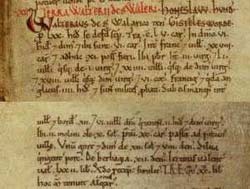 The complete, authoritative translation from the original Latin of Domesday Book, together with an index of places and a glossary of terms used. Digital Domesday on CD-ROM for Windows, Alecto Historical Editions available from GetMapping PLC.